Over the last months – before and after the signature of the “Mins 2 peace treaty” – daily reports of shelling and small arms attacks on the Ukrainian town of Avdeevka, 3 km north of Donetsk, appeared. However, the Ukrainian army never reported of territorial advances by enemy forces and thus own losses in land possession and defensive positions of the 35.000 inhabitants city, the biggest frontline town, directly bordering occupied Donbas. 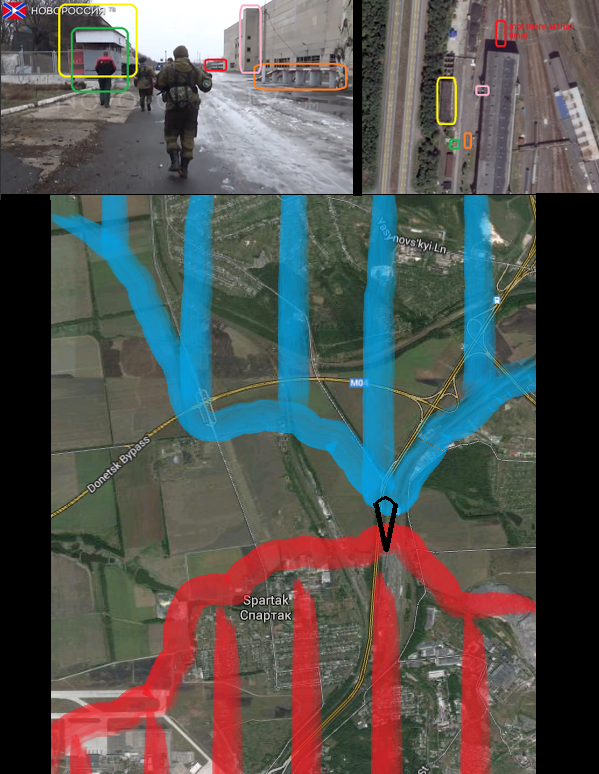 However, recent geolocated footage of Russian forces prove, also on this front, Ukraine is silently conceding land to the invasion army while claiming its forces hold the front since the fall of Debaltseve around February 20. Unfortunately, there is not much footage coming from the hot spot fighting areas North of Donetsk, mostly because it is life threatening to record it in the “triangle of death” between Avdeevka, Spartak and Opytne. 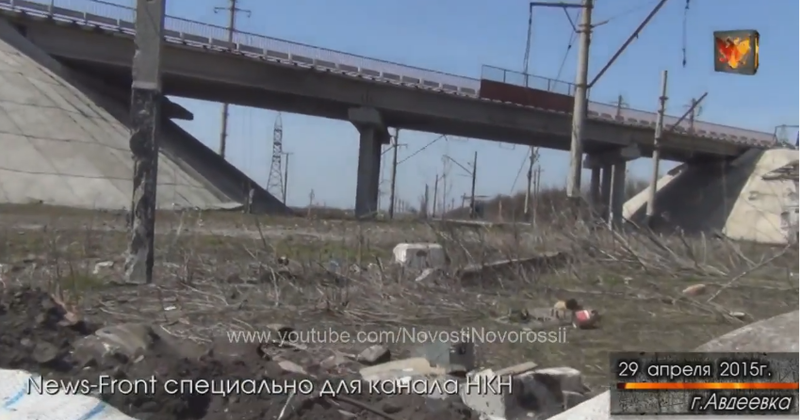 Thus, beside several written reports, the last geolocable footage from the area appeared in early February, when Russian forces pushed Ukrainian defenders back from the “passenger carload depot” train station, bordering Spartak to the east. Since then, the front seemed to have stabilized, not because of the – mostly “Minsk 2” imperative to not further advance, which is widely ignored by the Russian side, but because of the geographical circumstances, namely the open fields and rural landscape between Donetsk and Avdeevka, hampering unrecognized military movement in the area. This was a big luck for the Ukrainian side as the forest directly south of the inhabited part of Avdeevka offer a perfect launch pat for sabotage missions and bigger ground forces moves. Given the early February setting, approaching enemy forces could be spotted and addressed by snipers, tanks or even indirect artillery fire, which was an important precondition for a successful defense of Avdeevka against the backdrop of further Russian territorial aspeirations. All these advantages disappeared since then. 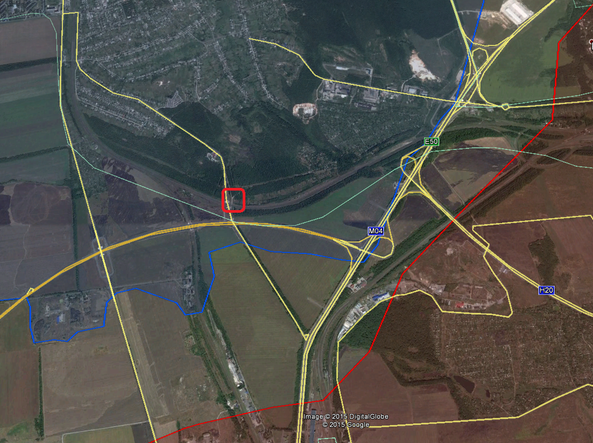 Geolocated and analyzed footage from April 28 shows Russian forces not just crossed the plain between Donetsk and Avdeevka, but also built (at least) one “bridgehead” on its northern side, just along the railway tracks. Hopes that these troops were only reconnaissance teams were short-lived when further footage from the area appeared, revealing bunkers and tranches, established in the area. It is not clear since when, these forces are stationed in the area, but the April 28 “good news” from Russian invasion media that they approached Ukrainian forces until 200 meters and a seemingly southwards oriented sand back installation, indicate the takeover took place during the last days, possibly coinciding with a Russian Grad missile attack in the area (strictly forbidden by the Minsk treaty). Although there is no more footage from the area, it must be assumed from the three available videos and the behavior of troops, seen in it, that other Ukrainian forward positions have also fallen meanwhile and there is little fear among filmed units at the front to be counterattacked from anywhere else than the north and possibly north west. Thus, the situation now looks – once again – much more gloomy for Ukrainian defenders, which – under daily small arms, mortar, artillery and Grad attacks seem to have left their forward positions along the February front. These withdrawals and – obviously – no attempts to recaptured the “Minsk-lost” territory have not just political implications (the weakness and timidity of the Ukrainian military and political leadership) but also severe strategic ones. Not just have the former Ukrainian-built trenches and bunkers fallen to Russian forces. Ukraine has also lost the ability to monitor and hence prevent larger scale military moves by the Russian invasion army in the area. 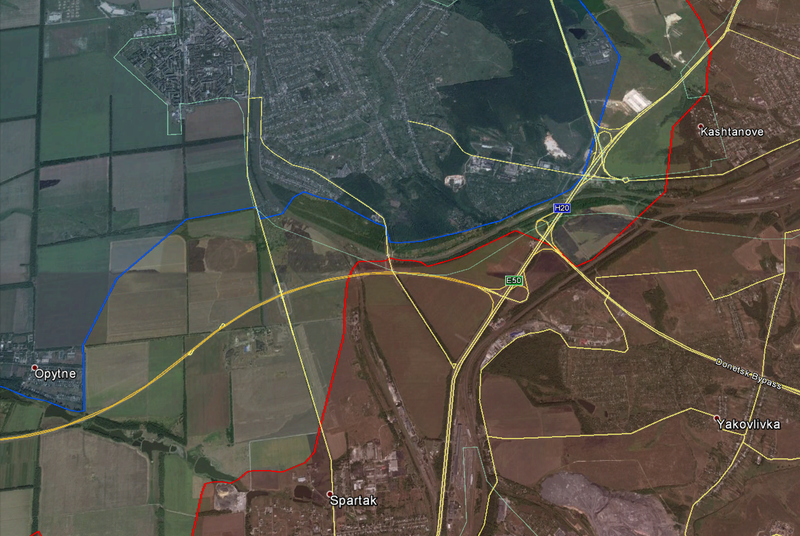 The next Ukrainian-held territory now seems to be in Opytne and Avdeevka itself. Both are located beyond possible visual axes to overlook the area, which adds to the strategic advantage of the Russian side (see example picture and map below). In conclusion, the “Minsk-silently-captured” 4 km² and strategically important forward positions South of Avdeevka add – just like the captured territory East of Mariupol and across the Serversky-Donets near Stanytsia-Luhanska – to the traditional Russian territorial gains during “Minsk times”. By these – Ukrainian-concealed – frontline developments during peace times, Russians get into the position to strike harder and more effective as soon as they decide to resume their offensives with all available means. The result of such moves were visible around Donetsk airport and Debaltseve, where Russian forces were allowed to moved into positions during calmer periods and then achieved all their military goals during more hot ones. It remains to be seen, if the latest silent Ukrainian losses will play a role in future military confrontations. But given the fact that the Russian invasion command in Moscow already set its eyes on strategically-important Avdeevka and knowing, Russia is doing everything in its power to upgrade its hybrid army in Ukraine, its silent advances – respectively, Ukraine’s irresponsibly-silent losses – could bear fruit for it rather sooner than later. This entry was posted in Ukraine and tagged Avdeevka, Donetsk, Russia, Ukraine by Julian Röpcke. Bookmark the permalink. What’s the matter with your twitter account??? I’m on Twitter under my real name now. Ok, but how can I find you on twitter. I don’t know what is your real name. Conflict_report twitter account is from yesterday Der StA and it is in no way what you used to post. Please leave here a note to your followers to let know how to go on following you. Thanks. Your old twitter account is pro-russian propaganda now. Did it get hacked? Twitter account was a great source of informations. I think that it was hacked, maybe this site also because there is no logical statement about what happened with twitter. Den versehentliche Abschuss der Malaysia Airlines Maschine MH17 im Juli 2014 (298 Tote) durch eine russische Flugabwehrrakete konnte ich bereits nach gut 30 Minuten bestätigen. Die Sichtung von Videomaterial und die (bei Bekanntwerden des eigentlichen Zieles gelöschte) Übernahme der Verantwortung durch russische Kräfte ließen keinen anderen Schluss zu. Sie konnten also in wenigen Minuten das beweisen , was die Westliche Welt bis heute nicht aufgeklärt hat? Please more Propaganda!